Toys "R" Us[nb 1] is an international toy, clothing, video game, and baby product retailer owned by Tru Kids, Inc. (d.b.a. Tru Kids Brands) and various others. It was founded in April 1948, with its headquarters located in Wayne, New Jersey, in the New York metropolitan area. Founded by Charles Lazarus in its modern iteration in June 1957, Toys "R" Us traced its origins to Lazarus's children's furniture store, which he started in 1948. He added toys to his offering, and eventually shifted his focus. The company had been in the toy business for more than 65 years and operated around 800 stores in the United States and around 800 outside the US, although these numbers have steadily decreased with time. Toys "R" Us expanded as a chain, becoming predominant in its niche field of toy retail, and also branched out into baby supplies and children's clothing. At its peak, Toys "R" Us was considered a classic example of a category killer. With the rise of mass merchants, as well as online retailers such as Amazon.com, Toys "R" Us began to lose its share of the toy market. The company filed for Chapter 11 bankruptcy protection on September 18, 2017, and its British operations entered administration in February 2018. In March 2018, the company announced that it would close all of its U.S. and British stores. The British locations closed in April and the U.S. locations in June. The Australian wing of Toys "R" Us entered voluntary administration on May 22 and closed all of its stores on August 5, 2018. Operations in other international markets such as Asia and Africa were less affected, but chains in Canada, parts of Europe and Asia were eventually sold to third-parties. The company continues to operate as the licensor of the chain's international operations, but its lenders announced in October 2018 that it planned to re-launch the U.S. Toys "R" Us retail business in the future, citing the value of its brand. The lenders also partnered with Kroger to add "Geoffrey's Toy Box" (named after the chain's mascot) pop-up departments to selected locations in order to give Toys "R" Us a presence during the holiday shopping season. On January 20, 2019, the company emerged from bankruptcy as Tru Kids. The logo used from 1985 to 1998 in the United States and Canada and in the United Kingdom and Ireland from 1988 to 1999. The logo used in the United States from 1998 to 2007. In April 1948, Charles P. Lazarus founded a baby-furniture retailer Children's Supermart in Washington, D.C., during the post-war baby boom. Lazarus, who served in the Army during World War II, opened the first store at 2461 18th St. NW. He began receiving requests from customers for baby toys. After adding baby toys, he got requests for toys for older children. It was acquired in 1966 by Interstate Department Stores, Inc., owner of the White Front, Topps Chains and Children's Bargain Town USA. The focus of the store changed in June 1957, and the first Toys "R" Us, dedicated exclusively to toys rather than furniture, was opened by Lazarus in Rockville, Maryland. Lazarus also designed and stylized the Toys "R" Us logo, which featured a backwards "R" to give the impression that a child wrote it. The original Toys "R" Us store design from 1969 to 1989 consisted of vertical rainbow stripes and a brown roof with a front entrance and side exit. To improve the company, the board of directors installed John Eyler (formerly of FAO Schwarz) in May 2000. Eyler launched an unsuccessful, expensive plan to remodel and re-launch the chain. Blaming market pressures (primarily competition from Walmart and Target), Toys "R" Us considered splitting its toy and baby businesses. On March 17, 2005, a consortium of Bain Capital Partners LLC, Kohlberg Kravis Roberts (KKR) and Vornado Realty Trust announced a $6.6 billion leveraged buyout of the company. Public stock closed for the last time on July 21, 2005 at $26.74—a 63% increase since when it first announced that the company was put up for sale. Toys "R" Us became a privately owned entity after the buyout. The company still files with the Securities and Exchange Commission, as required by its debt agreements. A Toys "R" Us/Babies "R" Us combined location in Waterbury, Connecticut, February 2018. 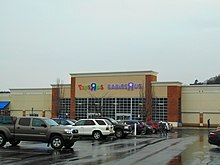 On August 23, 2011, Toys "R" Us announced it would begin to open combined Toys "R" Us/Babies "R" Us stores, with 21 new stores using the concept (11 of them having a full-sized "superstore" format), and 23 remodeled into the concept. The new locations were being built in Alabama, California, Georgia, New Jersey, and Texas. In December 2013, eight days before Christmas, Toys "R" Us announced their stores in the United States would stay open for 87 hours straight. The flagship store of the retailer in Times Square was open for 24 hours a day from December 1 to 24, to cater to tourists. The announcement came after snow and rain caused a nearly 9 percent year-over-year decline in U.S. store foot traffic. This move also pushed the retailer to hire an additional 45,000 seasonal workers to cater to the demand of the extended store hours. Since the toy business is incredibly seasonal, more than 40% of the company's sales come in during the fourth quarter of the year. In 2014, Toys "R" Us announced its "TRU Transformation" strategy, which concentrated on efforts to fix foundational issues affecting future growth, including making stores less cluttered, improving the customer experience, clearer pricing strategies and promotions, and tighter integration of its retail and online businesses. In 2015, the company launched the first of a new concept store called the "Toy Lab" in Freehold, New Jersey. The new layout provided more space for interactive exhibits and areas to play with new toys before purchase. This concept has since been expanded to stores in California, Delaware, Florida, New York and Pennsylvania. A Toys "R" Us store in Auburn, Massachusetts on June 24, 2018. On September 18, 2017, Toys "R" Us, Inc. filed for Chapter 11 bankruptcy, stating the move would give it flexibility to deal with $5 billion in long-term debt, borrow $2 billion so it can pay suppliers for the upcoming holiday season and invest in improving current operations. The company has not had an annual profit since 2013. It reported a net loss of US$164 million in the quarter ended April 29, 2017. It lost US$126 million in the same period in the prior year. It was initially stated that only the U.S. and Canadian operations would be affected, and that its brick-and-mortar stores and online sales sites would continue to operate. In January 2018, the company announced it would liquidate and close up to 182 of its stores in the U.S. as part of its restructuring, as well as convert up to 12 stores into co-branded Toys "R" Us and Babies "R" Us stores. It was later reported on February 28, 2018 that Toys "R" Us" was exploring the possibility of selling some of its corporately-owned locations in the U.S. to franchises, and closing the remainder. This would have left a smaller chain, consisting of its stronger Canadian operations, and 200 U.S. franchises. Toys "R" Us Inc. later announced that all U.S. locations would be closed. On March 15, 2018, Toys "R" Us received approval from the bankruptcy court to liquidate its stores. There were buyers interested in acquiring groups of stores to use as showrooms, as well as others interested in acquiring the chain's brand and associated intellectual property. The company indicated in filings that the Canadian operations were profitable, and desired to preserve the operations of the 82-store chain through a sale. MGA Entertainment had already made an offer to acquire the Canadian operations. Liquidation sales started on March 23, 2018. However, CEO of MGA Entertainment, Isaac Larian, and other investors are pledging $200 million to try to save about 400 of the remaining 735 US stores that are slated to close. A GoFundMe page briefly ran to pledge more money to Toys "R" Us, but was then closed on April 13. On March 29, 2018, they shut down purchasing on the website, making users redirect to an alternate sales site. On April 24, 2018, it was announced that the Canadian division would be sold to Fairfax Financial for approximately $234 million. This will keep the 82 remaining stores in Canada to continue running under the Toys "R" Us brand. Fairfax stated that it was potentially interested in purchasing U.S. locations as an extension of these Canadian operations. On June 29, 2018, Toys "R" Us shut down all of its remaining U.S. locations, after 70 years of operations. In early July 2018, it was reported that unknown benefactors had bought out all of the remaining stock of two locations in North Carolina so they could be donated. In November 2018, Fortune noted that the absence of the retailer during the 2018 holiday season represented a US$4 billion chunk of toy sales from which other retailers could benefit. Party supply retailer Party City capitalized on the closures by establishing temporary pop-up stores under the branding Toy City. Some of these locations are filling vacancies left by Toys "R" Us locations. On December 4, 2017, the company reported that it would be liquidating and closing at least 26 stores in the United Kingdom as part of an insolvency restructuring known as a company voluntary arrangement. After amassing £15 million in unpaid taxes, Toys "R" Us Limited entered administration on February 28, 2018. On March 2, 2018, it was announced that all UK stores would begin a liquidation sale, and on March 14, 2018, it was announced that all UK stores were expected to close within six weeks. On April 24, 2018, Toys "R" Us stopped trading in the United Kingdom after 34 years of service. On April 21, 2018, it was announced that UK and Irish rival Smyths would purchase Toys "R" Us stores in Germany, Austria and Switzerland, as well as Toys "R" Us Europe's head office in Cologne. Smyths said that all of the outlets acquired will be rebranded. On April 13, a bid was made by Isaac Larian to buy 356 Toys "R" Us stores for $890 million, but was rejected on April 17 and was fully scrapped on April 23. The Australian wing of Toys "R" Us entered voluntary administration on May 22. On June 20, It was announced that all of their Australian stores will be closing as well. The closure of all stores was concluded on August 5, 2018. While representatives of the Asian arm of Toys "R" Us have consistently cited that they operate as a separate legal entity from the parent company and are unaffected by events at the parent company, Toys "R" Us had engaged in talks since February 2018 to offload Toys "R" Us Asia's majority stake to a bidder for a proposed US$1 billion while outlets in Asia continue to operate unaffected. The planned bid was revised downwards to US$760 million in August and scheduled for September while Toys "R" Us sought a United States court order to strip Fung Retailing, a Hong Kong-based partner managing the majority of Toys "R" Us Asian operations, of its right-of-first-refusal purchase option and force Fung Retailing to release its share of the unit. This follows allegations by Toys "R" Us' of Fung Retailing delaying the sale via court proceedings filed through the Hong Kong judiciary system to discourage rival bidders and acquire Toys "R" Us' share at a lower price; the Eastern District of Virginia bankruptcy court would subsequently issue an order for Fung Retailing to drop its court order for the delay in a September 28, 2018, report. On November 16, 2018, Toys "R" Us Asia announced that the parent company has formally sold the Asian unit to Fung Retailing and multiple Toys "R" Us lenders at a valuation of US$900 million (later revised to US$760 million), with Fung Retailing receiving an increase in shares of the unit to become the lead shareholder of Toys "R" Us Asia and the unit securing the licensing rights to retain the Toys "R" Us namebrand. Restructuring and Tru Kids, Inc.
On October 1, 2018, the company issued a bankruptcy court filing which stated that it would no longer auction off its intellectual property, since its controlling lender planned to "[revive] the business behind the Toys 'R' Us and Babies 'R' Us brand names" with a focus on maintaining existing licensing agreements and establishing new retail opportunities. The company evaluated that selling its brand at auction "[was] not reasonably likely to yield a superior alternative." At the Toy Industry Association's Fall Toy Preview, the company unveiled plans for a preliminary venture to be known as Geoffrey's Toy Box, a wholesale store-within-a-store concept that the company planned to deploy in time for the holiday shopping season. The company planned to revive the Toys "R" Us and Babies "R" Us brands in the future. In November 2018, it was announced that grocery market chain Kroger would add toy displays under the Geoffrey's Toy Box brand to some of its locations, to sell selections of Toys "R" Us private-label products. The brand operates under Geoffrey LLC, an intellectual property holding company within Toys "R" Us. 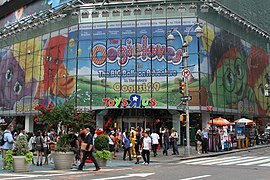 In July 2001, Toys "R" Us opened an international flagship store in New York's Times Square at a cost of $35 million. The 110,000 square-foot store included various themed zones such as an amusement arcade (known as "R"Cade), Barbie (with a life-size dreamhouse), electronics (with dedicated sections like Dance Dance Revolution SuperNova and Skullcandy), Jurassic Park (with an animatronic T-Rex), Lego, Wonka, and the signature indoor Ferris wheel. The store drew thousands of tourists for over a decade before the company decided to cancel its lease on the space in December 2015. In August 2017, Toys "R" Us announced a 35,000 square-foot temporary store near the original one that would be open around the holiday season. Since 2004, Toys "R" Us has partnered with the Toys for Tots foundation to serve as a donation site for anyone donating unwrapped toys or monetary gifts. Since the outset of the partnership, Toys for Tots has reported that Toys "R" Us campaigns have raised over $55 million and donated more than 4 million toys. The company also had a partnership with K.I.D.S./Fashion Delivers, a nonprofit organization that connects retailers, manufacturers, foundations and individuals with local nonprofit agencies. The Toys "R" Us Children's Fund, a public charity affiliated with the company, partnered with non-profits to provide products and monetary gifts to children in need. Toys "R" Us Children's Fund has contributed over $7.6 million to Save the Children initiatives in the wake of natural disasters like Hurricane Sandy, and in 2016, the charity gave a $1 million grant to Give Kids the World Village. In 2017, the company launched a short-lived philanthropic campaign with St. Jude Children's Research Hospital. On April 11, 2011, Toys "R" Us announced that it planned to cover 70 percent of the roof of its distribution center in Flanders, New Jersey with a solar installation. The company claimed this 5.38-megawatt solar project would be the largest rooftop solar installation in North America. Toys "R" Us has reportedly implemented high safety standards, and in 2007 vowed to take an aggressive approach towards holding vendors accountable for meeting those standards. Former chairman and CEO Gerald L. Storch, testifying before the Senate Appropriations Subcommittee on Financial Services and General Government on toy safety in September 2007, said he supported new legislation strengthening toy-safety standards and outlined new initiatives the retailer had set forth to ensure that its customers receive timely information on recalls (including a new website). In 2008, the company introduced stricter product safety standards exceeding federal requirements. Among the new standards was a requirement for materials inside toys to meet a standard of 250 parts per million of lead for all products manufactured exclusively for the retailer (compared with the federal standard of 600 ppm.) Toys "R" Us also announced the requirement that baby products be produced without the addition of phthalates, which have raised concerns about infant safety. The company has since adjusted its requirements to meet new federal standards enacted with the Consumer Product Safety Improvement Act of 2008. Until their liquidation and closing in 2018, the company owned 739 stores in the United States. The company also owns more than 750 international stores and more than 245 licensed stores in 37 countries and jurisdictions. Toys "R" Us in Richmond Hill, Ontario, Canada. Canada is among the earliest foreign markets be targeted for international expansion. In addition to its expansion in the United States, Toys "R" Us launched a worldwide presence in September 1984 when the company opened its first international wholly owned store in Canada and licensed operation in Singapore. Toys "R" Us then entered the United Kingdom market in 1985. During its most recent entry into a new market in November 2011 when it opened its first licensed store in Poland (Blue City), Toys "R" Us, International operated more than 600 international stores and over 140 licensed stores in 35 countries and jurisdictions outside the United States. At its peak, Toys "R" Us, International had presence in 40 countries. Many of these stores were corporately owned, but stores in some countries were independently owned and operated with Toys "R" Us licensing its name to a local company. Since 1995 the Al-Futtaim Group has operated stores in Bahrain, Egypt, Kuwait, Oman, Qatar, and the United Arab Emirates. Stores in Israel are operated by the Fishman retail group, while stores in Saudi Arabia are owned by Qatar Petroleum. Stores in South Africa, Namibia, and Zambia are also independently owned and operated. Toys "R" Us has extensive presence in East Asian territories and Southeast Asia under the umbrella of Toys "R" Us Asia, a loose amalgamation of joint ventures with local companies. Toys "R" Us stores operate in Brunei, China (mainland, Hong Kong, and Macau), India, Japan, South Korea, Malaysia, the Philippines, Singapore, Taiwan, and Thailand. The Asian unit was originally established in 1985 as a partnership between Toys "R" Us and Fung Retailing, the retail subsidiary of the Fung Group (a Hong Kong-based conglomerate that also owns Li & Fung, a major retail distributor), with the parent company owning a majority 85% stake while Fung Retailing owns the remainder of the shares. Following Toy "R" Us' sale of the Asian unit in November 2018, Fung Retailing becomes the lead shareholder of the unit, holding an increased share of 21% while Toy "R" Us' remaining 79% is distributed among a consortium of Toys "R" Us' lenders. In 1991, Toys "R" Us opened their first stores in Japan as a joint venture with McDonald's Holdings Company (Japan), Ltd. [jp]. The joint venture was supposed to last until 2018, but Toys "R" Us withdrew in 2006; after suing for breach of contract, McDonald's Holdings was awarded an ¥1.38 billion ($13.35 million) settlement in 2008. After their joint venture ended, Toys "R" Us increased their ownership from approximately 48% to about 61%, and integrated it into their overall Asian operation in 2017. Locations in South Korea and India are established through joint ventures formed in conjunction with Lotte Mart in 2007 and Lulu Hypermarket in 2017, respectively. Buoyed by increasing demand for toys in the Asia Pacific region, the Asian and Japanese arms of Toys "R" Us are among the Toys "R" Us subsidiaries that have remained profitable into the 2000s and 2010s, registering "double digit" revenue growth through the mid-to-late 2010s. In 2015, Toys "R" Us Asia posted a total turnover of US$1.85 billion; for the year ended January 2017, net sales from China and Southeast Asia totaled at approximately US$375 million while the Japanese arm would net sales of US$1.3 billion from Toys "R" Us, despite recently declining yearly profits, and US$20.3 million from Babies "R" Us. Due to its separate legal statuses from its parent company, the Asian units of Toys "R" Us have been predominantly unaffected by troubles at the parent company. Locations in Austria (14 locations), France, Germany (60 locations), Poland (16 locations), Portugal, Spain and Switzerland (7 locations) are corporately-owned. At its peak Toys "R" Us had 105 stores in the United Kingdom, the remaining 100 of which were closed by April 24, 2018. In April 2018, it was announced that Smyths would acquire stores in Austria, Germany, and Switzerland. As of July 2018 the sales are still pending. Plans for stores in other European countries have not been announced yet, but liquidation is likely. Toys "R" Us also operated stores in the Netherlands until 2009. Stores in Denmark, Finland, Iceland, Norway, and Sweden are owned by Top-Toy. The Canadian arm of Toys "R" Us began operation in 1983 and is headquartered in Concord, Ontario. As of its sale to Fairfax Financial on June 1, 2018, the chain comprises 82 stores which continue to operate under the Toys "R" Us name following the sale. Toys "R" Us in Chadstone Shopping Centre, Melbourne, Australia. Toys "R" Us closed its 44 stores in Australia on August 5, 2018. Kids "R" Us is a discontinued children's discount clothing retailer. Their first stores opened in February 1983 in Paramus, New Jersey, and Brooklyn, New York. The chain folded in January 2004 after the retailer suffered deteriorating same-store sales and to focus more on the Toys "R" Us brand. The first Babies "R" Us store opened in April 1996 in Westbury, New York. The store operates as a specialty baby products retailer and has grown to about 260 stores in the United States before their closing in the late 2010s. The stores offer an assortment of products for newborns, infants, and toddlers. The company also maintains a registry and offers pre- and post-natal classes and events. The stores are often co-branded with Toys "R" Us. The chain continues to operate outside of the United States. In May 2006, Toys "R" Us, Inc., acquired toy retailer FAO Schwarz including the retailer's flagship store on Fifth Avenue in New York City, as well as its e-commerce site, FAO.com. The company closed the FAO Schwarz flagship store in New York on July 15, 2015, citing rising rental costs, but continued to carry FAO Schwarz-branded toys in its Toys "R" Us and Babies "R" Us stores until 2017. For the 2009 holiday-shopping season, Toys "R" Us tried a smaller-store concept to attract customers and 90 "Holiday Express" stores across the United States and Canada were opened. The Holiday Express stores are smaller than regular Toys "R" Us stores, often in malls, and offer a more limited selection of merchandise than would be available at a stand-alone Toys "R" Us store. Most (if not all) of these 90 stores were opened in shopping-center and mall spaces that had been vacated by store chains closing their doors during the recession (including KB Toys, several of which were taken over by Toys "R" Us). Toys "R" Us's plan was to keep the Holiday Express stores open until early January 2010 and close them shortly thereafter, but the success of so many prompted the company to reconsider and several were kept open. These stores are known as "Toys "R" Us Express". Beginning in May 2010, Toys "R" Us opened a total of 600 Express stores. Four more were converted to Toys "R" Us outlet stores. As with the larger, basic Toys "R" Us stores, these locations also closed along with the outlet stores in the United States during summer 2018. The former logo of Toysrus.com. Toys "R" Us began selling toys online with the launch of Toysrus.com in 1998. Following a disastrous Christmas 1999 trading period during which the company failed to deliver gifts on time, Toys "R" Us entered into a ten-year contract with online retailer Amazon in 2000 to be the exclusive supplier of toys on the website. Amazon eventually reneged on the terms of the contract by allowing third-party retailers to use its marketplace to sell toys, citing Toys "R" Us's failure to carry a sufficiently large range of goods, including the most popular lines. In 2006, Toys "R" Us successfully sued Amazon; the company was awarded $51 million in damages in 2009, just over half of the $93 million initially claimed. It placed at No. 29 in the Internet Retailer Top 500 Guide for 2012. Toysrus.com was one of the most visited sites in the specialty toy and baby products retail category with an assortment of toys. In addition, Babiesrus.com offered a wide selection of baby products and supplies and access to the company's baby registry. Looking to expand its web portfolio, in February 2009, the company acquired online toy seller eToys.com from Parent Co., which filed for bankruptcy protection in December 2008. Financial terms were not disclosed. Around the same time, it was reported that Toys "R" Us, Inc. bought Toys.com for an estimated $5.1 million. Today, the company operates Toys.com to list unadvertised and exclusive deals available on its portfolio of e-commerce sites. In 2010, Toys "R" Us, Inc. reported that its Internet sales grew 29.9% year-over-year to $782 million from $602 million, and in April 2011, the company announced plans to open a dedicated e-commerce fulfillment center in McCarran, Nevada. The company later reported online sales of $1 billion for 2011 and $1.1 billion for 2012. The website was sunsetted with a brief farewell message when the US liquidation began in March 2018. The surviving international stores continue to sell merchandise online. Formerly known as "Dr. G. Raffe" in 1950s print advertisements for Children's Bargaintown, Geoffrey the Giraffe evolved in name and appearance over the next decade to become the official mascot of the renamed Toys "R" Us. Serving as a "spokesanimal" for the brand, Geoffrey's design went through several phases over the next 50+ years before the current star-spotted iteration was finalized in November 2007. In 2017, the company sponsored the live camera broadcast for April the Giraffe, which helped support giraffe conservation and awareness. The sponsored camera of pregnant April the giraffe went viral with millions of views on YouTube and across social media platforms. ^ Also written as Toys R Us, without quotation marks. A backwards "R" appears in its logo, but in type, it is written as a regular "R". ^ "Toys"R"Us, Inc. reports results for full year and fourth quarter of fiscal 2014". Toysrusinc.com. March 19, 2015. Retrieved September 30, 2016. ^ a b Hals, Tom; Rucinski, Tracy. "Toys 'R' Us seeks bankruptcy to survive retail upheaval". Reuters.com. Reuters. Retrieved September 19, 2017. ^ "Toys "R" Us Inc.: Private Company Information - Bloomberg". www.bloomberg.com. Retrieved January 9, 2018. ^ Flax, Steven (June 11, 1989). "Perils of the Paper Clip Trade". The New York Times Magazine. Retrieved April 10, 2014. ^ a b Zahn, James. "TOYS 'R' US OFFICIALLY EMERGES AS A NEW COMPANY, TRU KIDS BRANDS". The Toy Book. Retrieved February 13, 2019. ^ a b c Corkery, Michael (March 22, 2018). "Charles P. Lazarus, Toys 'R' Us Founder, Dies at 94". New York Times. Archived from the original on March 31, 2018. Retrieved April 28, 2018. ^ "Toy Retailer bought by Interstate Department Stores". New York Times. January 20, 1967. p. 86. (Subscription required (help)). Interstate Department Stores Inc., announced yesterday the acquisition for "several millions in cash" of the four-store Children's Supermart, Inc., Washington. Cite uses deprecated parameter |subscription= (help) Alternate Link via ProQuest. ^ "History – About Us – Toys"R"Us, Inc". toysrusinc.com. June 1957 – Foundation of Toys"R"Us®. Retrieved November 7, 2017. ^ "Toys "R" Us, Inc. - Company Profile, Information, Business Description, History, Background Information on Toys "R" Us, Inc". Referenceforbusiness.com. Retrieved December 1, 2012. ^ Johannes, Laura; Lublin, Joann (January 12, 2000). "Toys 'R' Us Names Eyler as Its President and CEO". The Wall Street Journal. Retrieved March 16, 2018. ^ a b "Toys R Us to Close Apparel Chain". Los Angeles Times. Bloomberg News. November 18, 2003. Retrieved March 15, 2018. ^ Hays, Constance L. (August 12, 2004). "Toys 'R' Us Says It May Leave the Toy Business". The New York Times. Retrieved March 15, 2018. ^ Bhatnagar, Parija (March 17, 2005). "Group to buy Toys 'R' Us for $6.6B". CNN Money. Retrieved March 16, 2018. ^ "Toys 'R' Us goes private". NBC News. Associated Press. July 21, 2005. Retrieved March 16, 2018. ^ "Investor Relations – Toys "R" Us Corporate". Phx.corporate-ir.net. Retrieved January 20, 2011. ^ "Toys R Us to open 21 new stores before year ends". Yahoo.com (Associated Press). August 23, 2011. Retrieved December 1, 2012. ^ Gustafson, Krystina. "Toys R Us to stay open for 87 hours straight". NBC News. Retrieved May 10, 2014. ^ "Times Square Toys "R" Us stays open 24/7". MyFox New York Staff. Fox News. December 2013. Archived from the original on May 12, 2014. Retrieved May 10, 2014. ^ "Retailers extend hours to help time-crunched shoppers". Mike Snider. USA Today. December 2013. Retrieved May 10, 2014. ^ Elliott, Stuart (October 2013). "Cloudy Forecast for Holiday Spending Prompts More Promotion". The New York Times. Retrieved May 10, 2014. ^ Jane, Emily (September 2013). "Toys R Us holiday hiring same as last year". Fox. CNN Money. Retrieved May 10, 2014. ^ "Toys "R" Us to Hire 45,000 Employees Nationwide in Advance of 2013 Holiday Shopping Season". PR NewsWire. Retrieved May 10, 2014. ^ Gustafson, Krystina (December 2013). "Toys R Us Creates Hell On Earth With 87-Hour Christmas Marathon". The Huffingtonpost. Retrieved May 10, 2014. ^ Verdon, Joan (March 26, 2014). "Toys 'R' Us: New game plan or same toy story?". NorthJersey.com. ^ Wilson, Marianne (March 26, 2014). "Toys 'R' Us posts Q4 loss; store updates part of new 'transformation' strategy". Chain Store Age. ^ Wilson, Marianne (March 27, 2014). "Toys 'R' Us to update U.S. store base; creating store of the future". Chain Store Age. ^ "Toys "R" Us - Toy Lab | Progressive AE". Progressive AE. Retrieved January 18, 2018. ^ "Toys "R" Us Makes Shopping Fun With Play Lab". Red Tricycle. October 23, 2017. Retrieved January 18, 2018. ^ Jones, Charisse (September 19, 2017). "Toys R Us files for bankruptcy". USA Today. Retrieved September 19, 2017. ^ Bhattarai, Abha (September 19, 2017). "Toys 'R' Us files for bankruptcy amid struggle to pay down billions in debt". Washington Post. Retrieved September 19, 2017. ^ a b Dunckley, Mathew (September 19, 2017). "Toys 'R' Us files for bankruptcy; business as usual in Australian stores". The Sydney Morning Herald. Fairfax Media. Retrieved September 19, 2017. ^ CNBC, Staff; Cormier, Bill (September 19, 2017). "Toys R Us joins bankruptcy list as Amazon exerts influence". CNBC. AP. Retrieved September 19, 2017. ^ "2018 Store Closure List" (PDF). toysrusinc.com. February 9, 2018. Retrieved May 29, 2018. ^ Hirsch, Lauren (March 14, 2018). "Toys R Us is exploring a plan that could keep 200 stores open even after liquidation". CNBC. Retrieved March 14, 2018. ^ Bhattarai, Abha (March 14, 2018). "Toys R Us to close all 800 of its U.S. stores". The Washington Post. Retrieved March 14, 2018. ^ Isidore, Chris (March 14, 2018). "Toys 'R' Us will close or sell all US stores". CNN.com. Retrieved March 14, 2018. ^ Hirsch, Lauren (March 15, 2018). "Toys R Us submits plan to liquidate its US business, will close or sell all US stores". CNBC. Retrieved March 15, 2018. ^ "Toys 'R' Us Files to Wind Down Its U.S. Business". The Wall Street Journal. Dow Jones. Retrieved March 15, 2018. ^ Hals, Tom (March 19, 2018). "Toys 'R' Us stores may be closing, but name will live on". Reuters. Retrieved March 19, 2018. ^ "Toys "R" Us in negotiations to sell Canadian business". Toronto Star. Retrieved October 7, 2018. ^ "Bid submitted for Toys "R" Us Canada by California toy company". Global News. Corus Entertainment. March 15, 2018. Retrieved March 15, 2018. ^ Thomas, Lauren (March 23, 2018). "Toys R Us liquidation sales start after a brief delay". CNBC. Retrieved March 23, 2018. ^ Isidore, Chris. "Billionaire CEO on a mission to save Toys 'R' Us". CNNMoney. Retrieved March 23, 2018. ^ "Click here to support Save Toys"R"Us organized by Save Toys"R"Us". gofundme.com. Retrieved April 2, 2018. ^ a b Siegel, Rachel (April 13, 2018). "This billionaire toy executive has a last-ditch mission to save Toys R Us, before it's too late". Washington Post. ISSN 0190-8286. Retrieved May 3, 2018. ^ "Toys R Us liquidation sales: Online orders, deadline to use gift cards, more FAQ". syracuse.com. Retrieved April 2, 2018. ^ "Toys 'R' Us will live on in Canada". Chain Store Age. April 24, 2018. Retrieved April 24, 2018. ^ "Fairfax eyeing some U.S. stores after Toys 'R' Us Canada purchase". Financial Post. April 26, 2018. Retrieved October 2, 2018. ^ Hirsch, Lauren (June 29, 2018). "Toys R Us stores close Friday, leaving behind nostalgia, anger and a chance of revival". CNBC. Retrieved July 1, 2018. ^ "At Toys 'R' Us, 'There Is Nothing Left': The Day It Closed for Good". Retrieved July 1, 2018. ^ Isidore, Chris. "Which retailers will be moving into all those empty Toys 'R' Us stores?". CNNMoney. Retrieved July 1, 2018. ^ CNN, Jessica Campisi and Brandon Griggs,. "Someone bought $1 million in Toys 'R' Us toys right before stores went out of business". CNN. Retrieved July 2, 2018. ^ Wahba, Phil (November 1, 2018). "Christmas Without Toys 'R' Us: Who will move in to fill the space under your tree?". Fortune (Paper). 178 (5): 12. ^ "Toy City pop-up stores will fill former Toys R Us, Babies R Us locations". NJ.com. Retrieved December 22, 2018. ^ "Toys 'R' Us announces plans to close at least 26 shops, just before Christmas". The Independent. December 4, 2017. Retrieved December 4, 2017. ^ "Toys R Us UK goes into administration". BBC News. February 28, 2018. ^ a b "All Toys R Us stores to close their doors". BBC News. March 14, 2018. Retrieved June 14, 2018. ^ a b "Toys "R" Us Limited ("the Company") – in Administration". Toys R Us (UK). Retrieved June 4, 2018. ^ "Smyths Toys to buy Toys R Us in Germany, Austria and Switzerland". The Irish Times. Retrieved May 29, 2018. ^ Isidore, Chris. "Billionaire CEO won't stop trying to save Toys 'R' Us". CNNMoney. Retrieved May 3, 2018. ^ "Toys 'R' Us Oz Enters Administration After Sale Falls Through | channelnews". www.channelnews.com.au. Retrieved May 23, 2018. ^ "Toys R' Us is officially shutting shop". The West Australian. June 20, 2018. Retrieved June 21, 2018. ^ "Australia's Toys R Us stores to close". SBS News. Retrieved June 21, 2018. ^ a b Mullen, Jethro (June 21, 2018). "Toys 'R' Us is shutting down in Australia, too". CNN. Retrieved July 15, 2018. ^ a b c "Toys 'R' Us Asian operations unaffected by company's 'financial restructuring'". Channel News Asia. September 19, 2017. Retrieved July 23, 2018. ^ "'Every year we are opening new stores': Toys R Us Asia not affected by US closures". Channel News Asia. March 23, 2018. Retrieved July 23, 2018. ^ a b c d Swift, Ryan (November 20, 2018). "Toys 'R' Us Asia aims to expand in the region after divorce from American parent". South China Morning Post. Retrieved January 11, 2019. ^ a b Macfarlane, Alec (April 12, 2018). "Toys R Us Asia deal will be far from child's play". Reuters. Retrieved July 15, 2018. ^ Church, Steven (August 7, 2018). "Toys 'R' Us Lenders May Swap $760 Million in Debt for Asian Unit". Bloomberg. Retrieved August 9, 2018. ^ Tay, Vivienne (August 8, 2018). "Toys "R" Us to auction off Asia operations, starting with US$760m bid". marketing-interactive.com. Retrieved August 9, 2018. ^ a b Church, Steven (September 28, 2018). "Toys 'R' Us Judge Orders Fung to Halt Hong Kong Court Action". Bloomberg. Retrieved October 26, 2018. ^ Ruff, Corinne (December 17, 2018). "Bankruptcy court approves Toys R Us Asia sale". retaildive.com. Retrieved February 20, 2019. ^ a b c Sakurai, Yoshino (November 17, 2018). "Toys 'R' Us sells Asia operations and keeps Japan business alive". Nikkei Asian Review. Retrieved January 11, 2019. ^ Rizzo, Lillian (October 2, 2018). "Toys 'R' Us Cancels Auction as Lenders Plan Brand's Revival". Wall Street Journal. ISSN 0099-9660. Retrieved October 2, 2018. ^ "Bloomberg - Are you a robot?". www.bloomberg.com. Retrieved October 2, 2018. ^ "A Toys R Us comeback? New name, same mascot Geoffrey emerge in post-bankruptcy plan". USA Today. Retrieved October 3, 2018. ^ "The Ghost of Toys R Us Will Haunt Kroger Stores This Holiday Season". Fortune. Retrieved November 29, 2018. ^ Telford, Taylor. "Toys R Us and Geoffrey the Giraffe are attempting a comeback with pop-ups inside Kroger stores". Chicago Tribune. Retrieved November 29, 2018. ^ "Kroger to revive Toys R Us for the holidays". Supermarket News. November 2, 2018. Retrieved November 29, 2018. ^ Bagli, Charles V. (August 2, 2000). "Toys 'R' Us to Build the Biggest Store in Times Sq". The New York Times. Retrieved March 19, 2018. ^ Wattles, Jackie. "Toys 'R' Us to open a Times Square pop up shop for the holidays". CNNMoney. Retrieved December 26, 2017. ^ "Toys for Tots celebrates 10th anniversary with Toys"R"Us - Good News Planet TV". Good News Planet TV. November 14, 2013. Retrieved November 21, 2017. ^ "Shaquille O'Neal, Toys "R" Us #PlayItForward for Toys for Tots". Retrieved November 21, 2017. ^ "Marine Toys for Tots Foundation". www.toysfortots.org. Retrieved November 21, 2017. ^ Lockwood, Lisa (August 15, 2016). "K.I.D.S./Fashion Delivers Selects Honorees for Annual Gala". WWD. Retrieved December 5, 2017. ^ "US: Toys R Us supports K.I.D.S/Fashion Delivers with $100 million donation". ToyNews. Retrieved January 23, 2018. ^ "Toys". Save the Children. Retrieved November 28, 2017. ^ "Toys"R"Us Children's Fund and Company Make Generous Donations to Give Kids The World". Give Kids The World Village. Retrieved November 28, 2017. ^ "Join Toys "R" Us and Babies "R" Us in supporting St. Jude". Retrieved December 14, 2017. ^ Lombardi, Candace (May 11, 2011). "Toys 'R' Us building massive rooftop solar project". CNET. Retrieved December 1, 2012. ^ d'Innocenzio, Anne (Associated Press) (December 16, 2007). "Toys R Us CEO vows to push toy safety amid slew of recalls". The Post and Courier. Retrieved December 1, 2012. ^ "Safety". toysrus.com. Archived from the original on February 19, 2013. Retrieved December 1, 2012. ^ Kavilanz, Parija B. (September 12, 2007). "Mattel CEO contrite before Senate". CNN. Retrieved December 1, 2012. ^ "Toys 'R' Us, Wal-Mart boosting safety standards". MSNBC (Associated Press). February 15, 2008. Retrieved December 1, 2012. ^ "About Us – Toys"R"Us, Inc". toysrusinc.com. ^ "About Us | Toys R Us". Toys R Us (UK). Retrieved June 15, 2018. ^ "Toys"R"Us, Inc. Expands Presence in Europe with Market Entry into Poland". Business Wire. October 26, 2011. Retrieved March 15, 2018. ^ "Toys R Us". Alfuttaim.com. Retrieved July 14, 2018. ^ Kane, Hadar (September 20, 1017). "Toys 'R' Us Israel Unaffected by U.S. Firm's Bankruptcy". Haaretz. Retrieved July 12, 2018. ^ Vallie, Zeenat (March 15, 2018). "We are still in business - Toys R Us South Africa". Business Report. Retrieved July 14, 2018. ^ Yoshihara, Nancy (September 27, 1989). "Toys R Us to Team With McDonald's in Japan". Los Angeles Times. Retrieved March 15, 2018. ^ "McDonald's sales hit record high". The Japan Times. February 5, 2009. Retrieved March 15, 2018. ^ a b "Toys "R" Us to take control of Japan operations". Reuters. May 13, 2008. Retrieved March 15, 2018. ^ Butler, Sarah (March 14, 2018). "Toys R Us to shut all UK stores, resulting in 3,000 job losses". the Guardian. Retrieved June 14, 2018. ^ Goldman, David. "Toys 'R' Us to close all of its UK stores". CNNMoney. Retrieved June 14, 2018. ^ McNaulty, Anton (April 24, 2018). "Smyths Toys to double in size with Toys R Us European buyout". The Mayo News. Retrieved July 12, 2018. ^ "Toys R Us to close all US stores". BBC News. March 15, 2018. Retrieved July 23, 2018. ^ "Toys 'R' Us pulls out of Holland". Dutch News. March 2, 2009. Retrieved July 14, 2018. ^ "Despite international rumours, TOYS"R"US in the Nordics is not threatened by bankruptcy". Top Toy. Retrieved July 23, 2018. ^ Reyes, Anthony (June 29, 2018). "No need to grow up, you can still be a "Toys 'R' Us Kid" in Canada". WKBW. Retrieved July 12, 2018. ^ Kerr, Peter (September 4, 1983). "The New Game at Toys-R-Us". The New York Times. Retrieved March 15, 2018. ^ "Our history". toysrusinc.com. Retrieved May 12, 2013. ^ "Babies "R" Us, Inc.: Private Company Information - Bloomberg". www.bloomberg.com. Retrieved November 16, 2017. ^ "Babies "R" Us offers free postpartum education classes". ABC11 Raleigh-Durham. September 22, 2014. Retrieved November 30, 2017. ^ Anderson, Mae (May 28, 2009). "Toys R Us Acquires High-end FAO Schwarz". Christian Broadcasting Network. Retrieved December 1, 2012. ^ "FAO Schwarz toy store in NYC closing July 15". usatoday.com. ^ a b Verdon, Joan (September 15, 2009). "Toys R Us goes on the offensive". The Record. Retrieved December 1, 2012. ^ DeMarrias, Kevin G. (December 30, 2009). "Toys R Us will keep selected Holiday Express stores open". The Record. Retrieved December 1, 2012. ^ "Toys "R" Us Announces Plans to Open 600 Toys "R" Us Express Stores in Malls and Shopping Centers, Doubling the Number of Toys "R" Us Locations Nationwide for 2010 Christmas Season". Press Releases – Toys "R" Us Corporate. September 9, 2010. Retrieved December 1, 2012. ^ a b "Toys"R"Us, Inc. Acquires eToys.com". Business Wire. February 12, 2009. Retrieved March 15, 2018. ^ Hansell, Saul (December 23, 1999). "Toys 'R' Us Falls Behind on Shopping". The New York Times. Retrieved March 15, 2018. ^ Masterson, Michele (August 10, 2000). "Amazon,Toysrus.com join". CNNfn. Retrieved March 15, 2018. ^ Metz, Rachel (June 12, 2009). "Amazon to pay Toys R Us $51M to settle suit". USA Today (Associated Press). Retrieved December 1, 2012. ^ Woodward, Kevin (November 20, 2012). "Toys 'R' Us debuts a dedicated e-commerce site for China". Internet Retailer. Retrieved December 1, 2012. ^ "Top Children Websites in the world". www.similarweb.com. Retrieved February 7, 2018. ^ "Toys 'R' Us Buys Toys.com Domain Name for $5.1M". domainnamewire.com. February 27, 2009. Retrieved December 1, 2012. ^ Brohan, Mark (April 20, 2011). "Toys 'R' Us opens a dedicated e-commerce fulfillment hub". internetretailer.com. Retrieved December 1, 2012. ^ "Toys 'R' Us 2012 10-K". ^ "Top 10 Christmas commercials of all time". www.businessreviewusa.com. Retrieved November 15, 2017. ^ "What happened to the Toys"R"Us giraffe?". That's it Magazine | Bloggers around the world. Retrieved November 15, 2017. ^ "April the Giraffe Is Helping Toys 'R' Us Break the Internet". Fortune. Retrieved December 7, 2017. 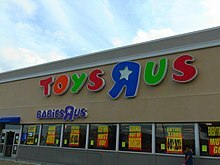 Wikimedia Commons has media related to Toys "R" Us.